After my experience at the Master Class with James Martin last year, Louise Cashmore from The Good Food And Wine Show offered me a complimentary ticket to participate in a workshop with a chef of my choice. 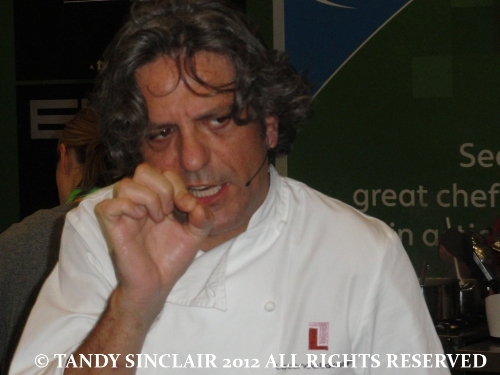 I chose to do a hands on workshop with Giorgio Locatelli, as I love Italian food, and the way he cooks. Last year, the master class cost R1500 and excluded entry. The hands on workshop this year cost R450 and Louise included an entry ticket for Dave and I for the show, which would have cost us R95 each had we paid for them. When we arrived we headed over to the VIP desk, and there were no tickets for us, even though I had been told that they would be left there. Thankfully the very competent lady from Computicket read the hard copies of the emails I had from Louise, and she organized two entry tickets. These had to be processed at another counter and I went to do that while Dave waited for her to sort out my ticket for the hands on workshop. I was given a hand written ticket and I explained to her that last year I had a problem with my handwritten ticket. She let us enter via the fast track entrance, and went with us to talk to the MC and to let him know that my ticket was in order. This year, the hands on workshop was once again open to the public for them to view the proceedings. It was however slightly cordoned off from the public by a line of plants. The seating arrangement was off to one side and Dave chose a seat where he could watch me and walk around to take photos. There was a red carpet to demarcate the entrance to the stage and it was separated from the public, but not that easy to see. I made my way into the queue when the MC asked us to line up on the red carpet (I walked across the stage to get there) and noticed straight away that the workshop was not fully subscribed. I made sure I headed straight to the workbench at the back where Dave could watch me cook and no-one came to join me. The MC then asked who from the audience also wanted to cook. I encouraged Dave to come up and join me, and he did, but I wonder how many of the other 7 paid participants minded that spaces were given away free to members of the audience? The workbenches faced the station Giorgio was working at, and when he was walking around he had two ‘helpers’ from the audience carrying on with the dish. Once again the sound was not great and it was difficult to hear Giorgio over the ambient noise of the show, and other MC’s elsewhere. Also, the person in the audience standing behind me trying to talk to Giorgio in Italian did not help matters much. 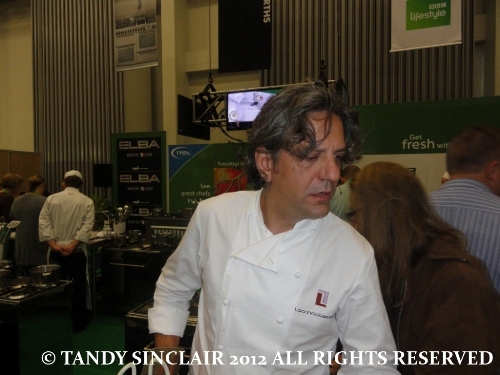 Giorgio and his sous chef did however walk around quite a lot to make sure it was really a hands on experience. 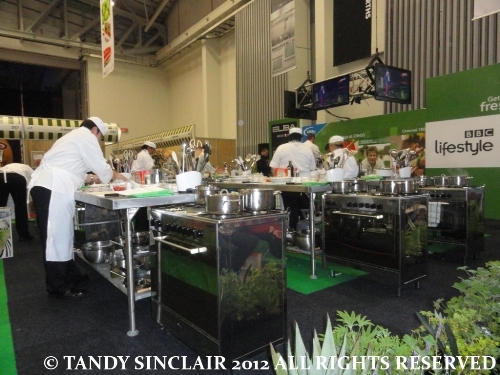 This year Capsicum Culinary Studio once again provided commis chef’s for the event. They were students in their first year of study, which meant that so far they had had at the most 5 months of training. I explained to the Young Mr Commis Chef (CC) at my workbench that I did not need his help, other than clearing away. He caused us no end of frustration with his getting in the way, and turning things off all the time. The ingredients were nearly perfect other than the fact that the Young Mr CC and his partner (who was more than helpful) were sometimes over enthusiastic about clearing away items so that resulted in some ingredients not being there when needed. Mr Helpful CC fetched us water and watched and learned! Our first task of the day was to make pasta. Giorgio told us that the recipe we had in front of us was not correct. However, I checked it against the one in his recipe book and it was word for word the same. The pasta recipe called for an egg yolk, and we had a whole egg in front of us, which is what the pasta needs. I learnt a great trick – if your pasta needs more liquid, touch your hands to a pot of hot water and use your slightly wet hands to add the moisture. Once I had got the pasta to the consistency that I was told was OK, we had to roll it. Young Mr CC started getting in my way at this stage. He had never made a pasta before and started offering advice. This really got to me, as he was talking nonsense and I could not hear what Giorgio had to say. The pasta machine could not be secured to the table, and too many hands got in the way. The pasta was ruined but thankfully there was a batch of ready made and ready rolled ones at the back. We then proceeded to cut the pasta (and I cut my hand). Mr Helpful CC went straight off to get me a plaster. There were no wet wipes this year (it was a huge plus last year) and no dry towels, so I used my apron (a lovely take home gift) and dealt with the blood the best I could. I always maintain that sharp knives don’t cut you as they don’t slip, but this was entirely my fault for watching Giorgio and not the knife! We then proceeded to roll our pasta into shapes (see my post here) and even though we had too thick pasta and not the right tool, we managed quite well. We had our pesto made as best we could given that we did not have a proper pestle and mortar, and then tried to cook the pasta. Young Mr CC had turned the water off so many times that it was not boiling, but he just put the pasta in. As it was on a low gas flame it did not come back to the boil and Dave tried to rescue it by moving the hot handled pot without oven gloves. 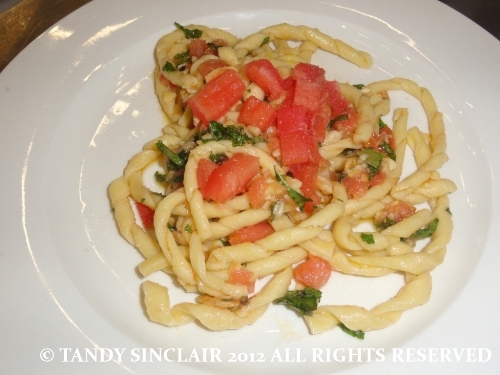 We tossed the pasta with the pesto and it was not too bad, but I am sure I can make a vast improvement at home. 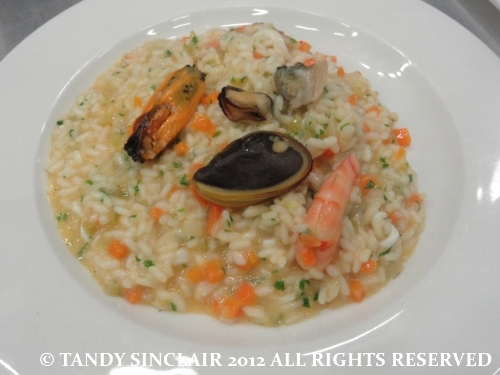 Next on the menu was to make a risotto and I learnt a few new tricks – another new recipe to follow soon. However, we were told the recipe was wrong and so I waited to see what Giorgio did with his prawns. He did not tell us to peel them, so mine went in shell on – after Young MR CC told me they were peeled, which I could see they were not! Any case, all it really meant was eating the prawns with our hands. Young Mr CC also kept turning the stock off so it was not at a rolling boil. 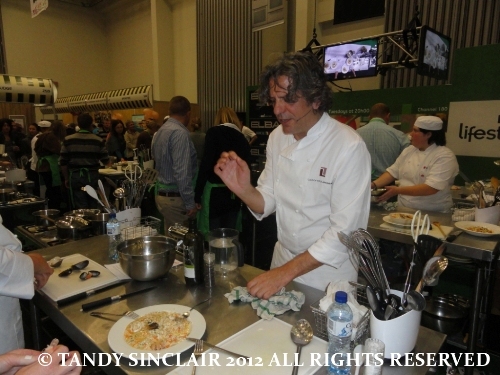 My risotto got a thumbs up from Giorgio so that was a good result for me. We were offered take away containers this year – after the pasta had been cleared away. We chose not to take the risotto home as it does not heat well in my opinion. Once again, the sous chefs did not know what was going on – they had never even made a similar dish before, let alone the dishes we were making. I was told last year from Capsicum Culinary Studio as a way of an apology that they would invite me to a chocolate making course as their guest. The invitation never arrived! This year all I can pass on to them is to please prepare your staff by letting them make the dishes for the show during the week before the event. Equip them with the knowledge to help, and tell them to listen to what is being said to them and asked of them. 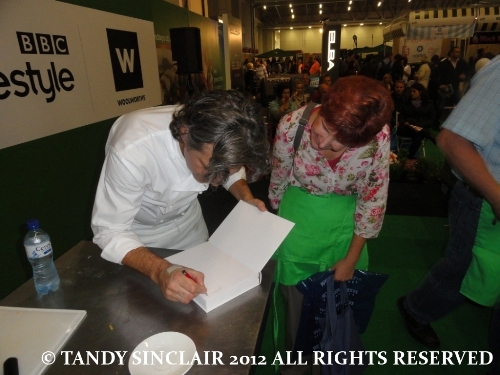 I was very grateful to Giorgio for signing my book, as he was in a rush to get somewhere as soon as the workshop was finished. Sadly, not much of his time would be spent seeing our lovely city as they arrived on the Thursday (after the “meet the chef’s for canapes” that I went to on the Wednesday as a guest of the Good Food and Wine Show at the Cape Grace) and he went back home the Monday after the show. This year was far better than last year as far as value for money goes. 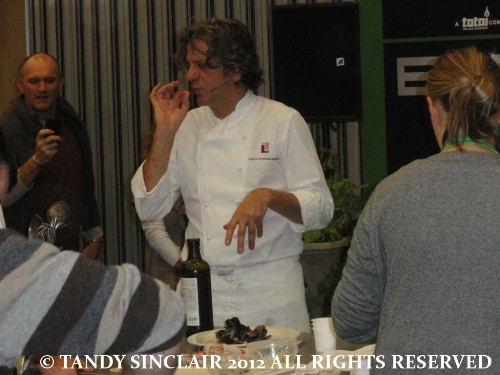 I would much prefer to see the workshops reverting back to the format of being private so that we can hear the chefs. Thank you Louise for making sure I was able to participate this year, and I look forward to being able to do so next year again. Why on earth would you want to go next year when you clearly didn’t enjoy it? When did you have time to take such nice photos! Nothing worse than a “I know it all” commis! You lucky you only dealt with one for the workshop, I am stuck with them all day!!! These workshops don’t seem to be all that successful? Did you mention it to the organizers again this year? It almost sounds like you could be running your own show, Tandy! I’d come!! So would I!! My thoughts exactly!! Glad is was better than last year but it still all sounds a bit haphazard – such a sham efor you. And as for the CC…what a nightmare!